Coryphantha vogtherriana Werderm. & Boed. Origin and Habitat: Coryphantha vogtherriana is found in San Luis Potosí, Mexico, near the city of San Luis Potosi in Cerro de San Pedro municipality (localities Monte de Caldera, about 20 km north-east of the city of San Luis Potosi, Ventura, Fatima and San Antonio del Guia). Habitat and Ecology: This species grows on calcareous soils in clusters hidden in the grass in forests. The habitat is now an induced loamy grassland as a result of the felling of the Quercus woodland that previously dominated the area. The grassland with rolling horse pastures is crossed by red ditches formed by erosion. The habitat is locally classified as pastizal inducido (induced grassland; Rzedowski 1978). This species is uncommon. 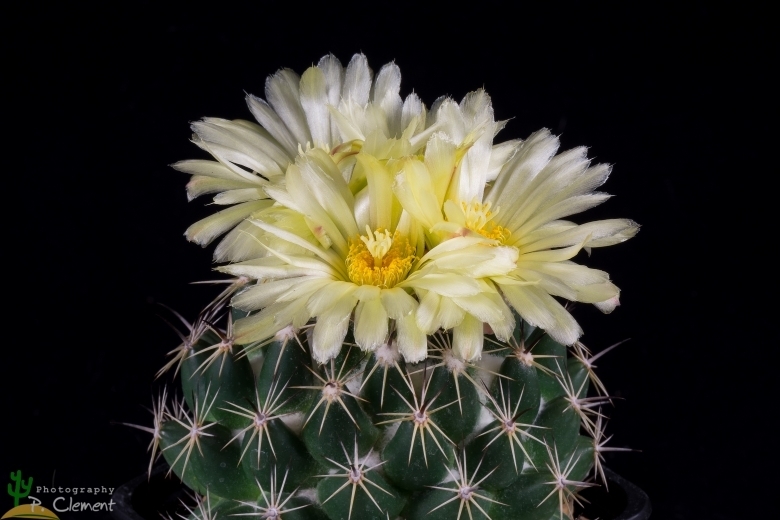 Associated cactus: Mammillaria heyderi. The population is estimated to consist of more than 10,000 mature individuals. There are no major threats to this species. Minor threats include erosion, deforestation and trampling by animals pasturing in their habitat and agriculture. Description: Coryphantha vogtherriana is a solitary globose cactus specie occasionally forming low clumps. The stems usually grows deeply embedded in the soil. The presence of the red nectary glands and the mucilaginous cortex, distinguish it from the closely related, glandless Coryphantha maiz-tablasensis. Moereover C. vogtherriana has a central spine and more edged, flattened tubercles (C. maiz-tablasensis has rounder tubercles and no central spines). Stems: Globose, usually deeply embedded in the soil, dark green to blue-green, to 3 cm high, and 5-6 cm in diameter. Tubercles: Loosely arranged, conical to ovoid, somewhat edged, and flattened to 17 mm long, axils densely woolly, with glands. 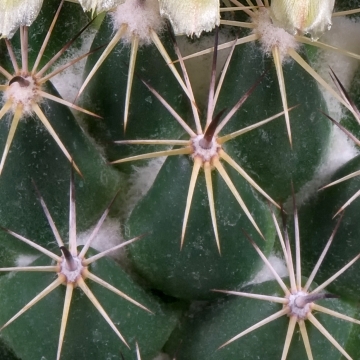 Concerning the tubercle groove, this species shows a particular phenomenon which is known in Ortegocactus and, within the genus Coryphantha, only for Coryphantha ottonis and Coryphantha georgii: even at flowering age the relatively large tubercles may occur without grooves or possess very short grooves only. The appearance of complete grooves usually occurs only in very old plants. Central spine: One, hooked, erect or descending, rarely hooked, thickened at the base on older plants only, 5-20 mm long, horn coloured to brown, soon greyish-white. Radial spines: 4-6 (or more), needle-like, in youth whitish, horn-coloured or brown, later greyish-white, often with darker brown tips, spreading horizontally, slightly curved to the side, somewhat curved to the body, upper ones somewhat closer to each other,(5-)7-13(-15) mm long. Flowers: Pale yellow, to 3-4 cm in diameter, 3.5 cm long, with much wool at the flower-base. Perianth segments 24-34 broad lanceolate, up to 3 cm long, 2.5-4 mm wide, margins entire. Outer perianth-segments with a strong, dark red midstripe. Inner perianth segments white, at times yellowish-white, sometimes with a faint pink-coloured midstripe and often with reddish tips. Stigma lobes 5-8, light yellow, anthers dark yellow, ovary small and oval. Fruit (Berries): Small (8 mm long, 5 mm diameter), green juicy, with much white wool at the base and attached flower remnants. Seeds: Kidney-shaped, 1.2 x 0.8 mm, light brown, surface net-like. 1) Anderson, E.F. 2001. “The Cactus Family.” Timber Press, Portland. 3) Arredondo G., Sotomayor M., Sánchez B. and Martínez M. 2001. “Cactáceas Amenazadas de Extinción del Estado de San Luis Potosí, México.” CD ROM. Edit. : INIFAP-CIRNE. Publ. Esp. F-015, San Luis Potosí, México. 5) Bravo, H. and Sánchez-Mejorada, H. 1991. “Las Cactáceas de México”. Vol. 2. Universidad Nacional Autónoma de México, D.F. 7) Hunt, D. 1999. 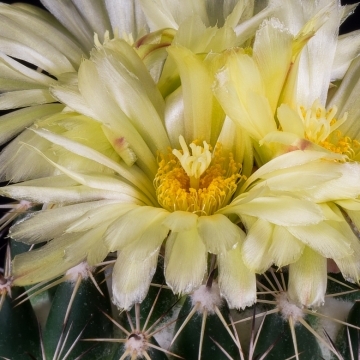 “CITES Cactaceae Checklist”, 2nd ed. Royal Botanic Gardens, Kew and International Organization for Succulent Plant Study (IOS). 8) Hunt, D., Taylor, N. and Charles, G. (compilers and editors). 2006. “The New Cactus Lexicon.” dh Books, Milborne Port, UK. 9) Rzedowski, J. 1978. “Vegetación de México.” Limusa, Mexico. 397 pp. 10) SEMARNAT. 2010. “Norma Oficial Mexicana NOM-059-SEMARNAT-2010, Protección ambiental-Especies nativas de México de flora y fauna silvestres-Categorías de riesgo y especificaciones para su inclusión, exclusión o cambio-Lista de especies en riesgo.” Diario Oficial de la Federación. 11) Fitz Maurice, B & Fitz Maurice, W.A. 2013. Coryphantha vogtherriana. The IUCN Red List of Threatened Species 2013: e.T40823A2934587. http://dx.doi.org/10.2305/IUCN.UK.2013-1.RLTS.T40823A2934587.en. Downloaded on 13 May 2017. Cultivation and Propagation: In culture without problems and very willing to flower C. maiz-tablasensis needs a deep pot to accommodate its beet root. Full sun to light shade in summer. Water sparingly, keep drier in winter. Needs good drainage. Frost Tolerance: Hardy to -4°C.